Looking for the Best 8-Person Ten? To recommend one tent as the best eight-person tent for group camping, we have to go with the CORE 9-Person Extended Dome Tent. As its title explains, the tent can fit up to nine people inside. It's spacious enough for three queen air mattresses. Much of the roomy interior is thanks to the addition of two extra ridge poles. More than providing room, this tent is useful if you're camping in rainy weather. This uses H2O Block Technology that offers heat sealed seams so that water doesn't get inside. For those humid camping days, something that can be intensified with more people in the tent, this has advanced, adjustable vents. There's also a large mesh ceiling and a few mesh windows for extra circulation. When camping with a group, you may not always want to stick to individual tents that maybe fit one or two people. Thankfully, many tents are capable of fitting eight or more people. On the other hand, finding quality ones isn't always simple since there are many tents out there. To help you in your search, we discovered five top-rated 8-person tents your group will love. These tents can fit eight or more while still offering space for other items such as luggage. This may be especially useful for families camping together. 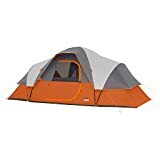 Also, we'll discuss the essential features and aspects that you should keep in mind when shopping for an 8-person tent that will help you find the best product for your needs. So, you're going camping with a group of friends or family, and you want to be sure that everyone is comfortable and has their own space. Before you decide on any tent, the following guide below will offer some more information about these large tents such as details about materials, room dividers, storage space, and more. Materials – What Makes for a Sturdy, Large Tent? As you are seeking a tent large enough to fit eight people, whether it is adults or a mix of children, you can't opt for the same quality materials found in smaller tents. With a more massive tent that's spread out, there comes a risk of it being blown away. So, you want first to find ones made with reinforced poles (e.g., steel) that can hold its weight and withstand the wind. A large tent also sees plenty of foot traffic. So, you want the fabric to be as reliable against the weather as it is to you and your family or friends. Room Dividers – Are They Necessary? Of course, you can have fun in a broad, spacious tent with no restrictions. However, most cabin-sized tents come with the option of setting up room dividers. Whether this divides the room in two or three, they can be beneficial depending on your preference and circumstance. For instance, many families traveling with children may want to give the kids their own space. This can help them enjoy the outdoors a little more, while the adults don't have to fight for room on their side. It's even true of camping with friends. This can help couples pair off or give individuals who want more privacy a chance to get it. If you are going to use room dividers, find a tent that makes it easy to set them up and break them down. You may not want to spend more time putting up a wall than you did the entire tent. If you're here, then you're in need of quality tents that can fit at least eight people. Of course, you should understand that it's a blanket statement. One tent may very well be able to fit eight adults with some even being as tall as 6ft. On the other hand, a tent may be able to fit eight people in theory, but it works better if you're camping with kids or teenagers who don't take up much room. Looking for A Bigger or Smaller Tent? Looking for a smaller 4 man tent? When you're searching for tents, it may be helpful to take a good look at the interior. Does it look like it'll fit everyone that's coming on your camping trip? What about the gear you're packing? Many large-sized tents have a separate area for equipment so that it doesn't take up sleeping room. If you know you'll need more space for your things, consider finding a tent with a screen room or extended awning out front that can keep your gear out of the way, but still protect it from the outside elements. Like all camping tents, having the right amount of weather protection is a vital feature to keep in mind. Tents large enough for groups don't need to be weighed down by heavy rainfall. So, it may be useful to find tents that have fabric treated with water-repellent properties. This allows water to bead off and fall to the ground outside rather than stick to and seep inside your tent. Also, if you're camping out in warm weather, it's an advantage to find a tent with a lot of vents and windows. With a group of people all camping in one tent, things can get humid fast. So, with proper air circulation, no one feels uncomfortable. If you've never pitched a tent before, you may hesitate with tents of this size because they can seem intimidating to set up. However, there are many quality tents for group camping that even camping newcomers can pitch alone. For those of you who consider time a factor, perhaps you may opt for the instant tents. These generally take less than two minutes to set up as it's practically done for you already. However, you may sacrifice some quality and stability with these types of tents. If you want something you know will be rugged and long-lasting, then you may want to consider the traditional cabin-like tents. Coming from a good brand using good materials, these tents should still take less than 20 minutes to pitch fully. CORE 9-Person Extended Dome Tent is one of the best group tents you can have seeing how much you can fit inside its spacious interior. With the number of people that can fit inside, it's useful to have proper ventilation so that it doesn't get too humid. Cool air is drawn in from the adjustable ground air vents, and in turn, hot air is pushed out through the mesh ceiling. Of course, it means this tent may offer minimal insulation in colder weather, so it's best used in the warmer months. In the event of rain, the tent features a rainfly and H20 Block Technology to seal the seams and fight off water from entering. For windy days, it features a sturdy fiberglass frame that keeps it upright. 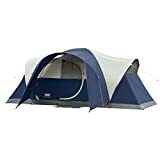 If you're interested in additional features, the tent has an E-port where you can run an extension cord into the tent. 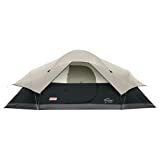 The CORE 9-Person Extended Dome Tent is one of the best group camping tents as it offers incredible space for people, mattresses, and any items you may want to bring on the trip. Coleman Elite Montana 8-Person Tent can fit the whole family or a smaller family who has a lot of gear. 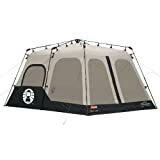 If you need room to store all of that gear, the extended door awning can create a dry area outside of the tent where you can lay items such as shoes down. With its cabin-like design, it can truly feel like you brought your home to the outdoors. Worried about lighting? This tent has you covered as it features six built-in CPX LED lights to illuminate the tent at nightfall. For daytime hours, the windows auto-roll down once you unzip them so sunlight can stream through. For weather protection, in addition to the rainfly, the fabric itself repels water well. As for temperatures, it can get humid inside so that it can do with some greater air circulation. The Coleman Elite Montana 8-Person Tent is perfect for camping with gear thanks to the extended awning that provides room for muddy shoes and the likes all while illuminating everything courtesy of the built-in lights. Wenzel 8-Person Klondike Tent is said to sleep eight, but you may have an easier time with children mixed in rather than eight tall adults. No matter, the tent provides, you can put up a wall to act as a room divider. This can be helpful if you want adults to sleep separate for your children, or if you want a place to store all of your gear out of the way. As it features a screen room, you may lounge in it on those hotter summer days picnicking in the park. It allows for a comfortable breeze to enter, something that the vents aim to enhance. Because of that screen room, however, this isn't the tent to take out camping in the cold. It does have good protection against the weather. Polyester fabric has a water-resistant coating applied. Also, the seams are double-stitched and lap-felled, so water cannot penetrate. Even the zippers and webbing are treated with water-repellent properties so that you and your gear remain dry even in harsh rain. The Wenzel 8-Person Klondike Tent may be one of the best tents that features not just a room divider, but a screen room that can keep everyone cool in warm weather camping. 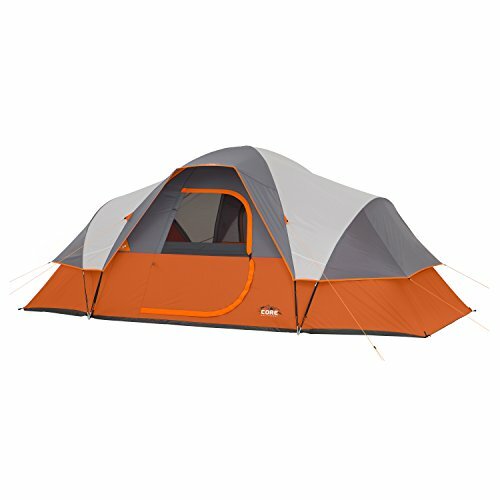 Coleman 8-Person Instant Tent lives up to its name with how quickly you can set it up even without help. You should be able to get it done in less than five minutes as all you have to do generally is unfold it, extend it, and secure it. Once it's set up, you have a vast amount of space to fit a family or group of friends for a fun outing. It's noted that you can fit two queen-sized air mattresses inside and still have room. Concerning its durability, you may want to replace the stakes it comes with for stronger ones. Nevertheless, the tent has solid fabric that can withstand some rough use. It also has a WeatherTec system to protect it from rain and keep the tent and yourself dry. For ventilation purposes, this tent utilizes large screens that protect well against mosquito invasions and other pesky insects. You can still get some good lighting during the daytime through the windows. There are storage pockets inside for small items, and you can divide the rooms for privacy. The Coleman 8-Person Instant Tent is the go-to tent for group camping for those who may not want to spend a lot of time pitching the tent as it takes around a minute or so to set up and get going. Coleman Red Canyon 8-Person Tent is a quality family camping tent to take with you on the road. It takes less than 20 minutes to set up, and you can cut your time down even more if you've done it before. When you get to the room dividers, a bonus if you may be traveling with kids, you can change the tent into three different rooms. Mom and dad can have their room, the kids can have theirs, and you can even use the third part to store gear out of the way. It's a tent that can benefit your family at the campsite as much as it could right in your backyard. Likewise, with other tents from the company, this includes a good deal of weather protection from the welded floor to the inverted seams. You may receive some low-quality poles and such due to some problems with quality control. However, if you have the right tent, the frame should be durable enough to withstand some moderate winds and rain. The Coleman 8-Person Red Canyon Car Camping Tent has the benefit of allowing you to separate it into three rooms, making traveling with a group or family even more fun as you get your own privacy when it's time to sleep. Looking for Something Else Entirely? Consider taking along a popup shade canopy to cook or chill under cover. Which are the best tents for family camping? What are the best camping brands? Looking for the best camping fan?